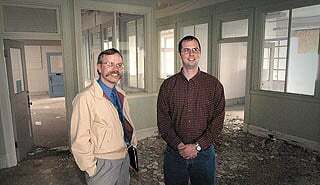 DAVID GRUBBS/Gazette Staff Billings architect Randy Hafer, left, and Salt Lake City builder Jeff Pugmire are partnering with Andy Rice of Redmond, Wash., to purchase and renovate the Stapleton Building at First Avenue North and Broadway. An architect and developer who has already been busy with renovations on Montana Avenue and south of the railroad tracks is ready to move into the central business area of downtown Billings. Randy Hafer and two partners, Jeff Pugmire and Andy Rice, are planning to convert the empty Stapleton Building at Broadway and First Avenue North into three floors of offices and residential condominiums, with a retail business or a restaurant on the ground floor. They hope to close on the building by May 1 and have the project finished a year or so after that. They have their work cut out for them. The street-level space, formerly home to Desmond's Store for Men, is in good shape, but the top three floors were originally used for offices, and the space is divided up into dozens of rooms of all different sizes. The rooms were further chopped up or consolidated over the years, and numerous "improvements" were made. The three floors now are a virtual museum of awful design ideas and construction practices. There is '60s-era brown wood paneling, cheap drop-ceilings, shag carpet in a half-dozen hideous colors, painted-over woodwork and tiled-over wood floors. Hafer, the owner of High Plains Architects, sees only potential. "It really was a handsome building," he said. The Stapelton was constructed with a three-story opening in the middle, to provide natural light to every room on every floor. Ken Kunkel, the real estate agent who helped close the sale of the building, said it has slightly more than 200 windows, many of them 7 feet high. Plans are to restore the building inside and out to its original look and have it listed on the National Register of Historic Places. Built in 1904, it was designed by the firm of Link & Haire, which designed the original Parmly Billings Library and the City Hall, as well as more than 100 other buildings locally. The partnership developed when Pugmire, who lives in Salt Lake City, decided he wanted to move to a smaller city. His wife is from Lovell, Wyo., and he'd spent some time in Billings, so he looked for opportunities here. He was also advised by a financial agent in Salt Lake that the Billings market was "hot." After poking around a little, Pugmire hooked up with Hafer, who has been involved in four other loft projects in the downtown area. "I'm in construction and I wanted a project," Pugmire said. "So I said, why not do our own project and start a company?" His business, Pugmire Construction Services, will be the main contractor on the building, and Pugmire intends to move to Billings soon. Rice, who lives in Redmond, Wash., is Pugmire's brother-in-law. He is president of Idylwood Management Corp., which provides accounting and management consulting services to companies in Washington and Hawaii. Pugmire originally went to Rice for financial advice, but Rice ended up signing on as a general partner. Pugmire said Rice heard from people in Washington what he'd heard in Salt Lake — that Billings was ripe for development and investment. The partners are getting their financing partly from a commercial bank and partly from grants and loans through the Downtown Billings Partnership. They hope to interest a restaurant in using the ground floor, which has big windows facing Broadway and First North, but they are also willing to lease it to a retailer. There are 56,000 square feet on the four floors, with about 26,000 square feet available for office space. On the third floor, the plan is to create eight to 10 high-end loft-style condominiums of one to three bedrooms and encompassing 1,000 to 2,000 square feet. There would be at least 16 parking spaces in the basement, with some additional room for storage. Hafer said the fact that two out-of-state investors see such potential in Billings is good news. "This is important for downtown," he said. "They're coming here because things are happening in Billings." Ed Kemmick can be reached at 657-1293 or ekemmick@billingsgazette.com.